Although Tibet has always had many accomplished female Buddhist practitioners, out of modesty few have emerged asprominent teachers. 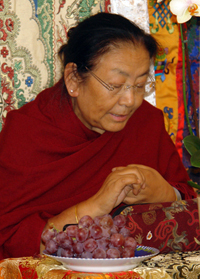 To have Jetsun Kushok Chimey Luding, one of the most respected female teachers of TibetanBuddhism, among us is very auspicious and precious indeed. Born in 1938 as the sister of the current head of the Sakya lineage, one of the four main sects of Tibetan Buddhism, she received much of her training alongside her brother, His Holiness the Sakya Trizin, from such legendary teachers as Jamyang Khyentse Chokyi Lodro. Devoting herself to Buddhist practices from an early age, she completed her first retreat at age 10. Many more important retreats like Hevajra, Chakrasamvara and Vajrayogini were to follow, enabling her to become one of fewer than a dozen masters who are qualified to transmit the Lam Dre or "The Path that Includes the Results." Lam Dre, like Dzogchen, Ziji Chod and Kalacakra Yogas, is among Tibet's "Eight Chariots," or unique and complete systems of meditation practices leading to Enlightenment. Jetsun Kushok gave her first transmission of the Lam Dre, along with all thenecessary empowerments, at age 17.